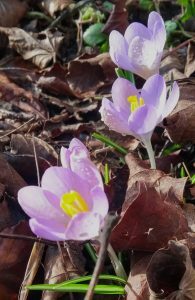 So here we are, February already, and the garden is positively bursting into life. 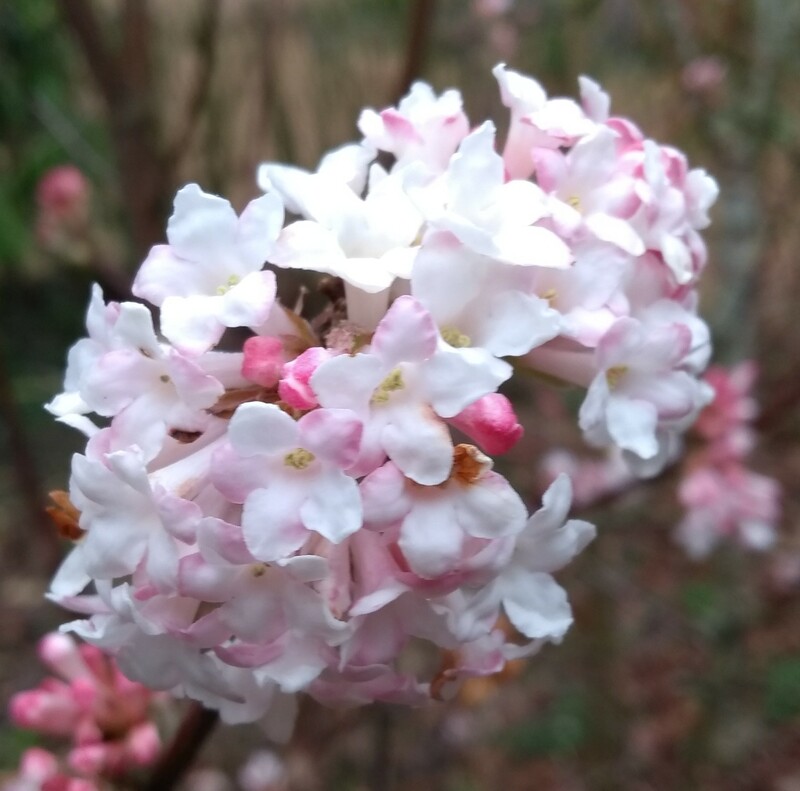 With sweet scented flowering shrubs such as Viburnum x bodnantense ‘Dawn’, Sarcococca confusa, and myriad varieties of Hamamelis; tuberous winter aconites; and bulbs such as crocus tomassinianus and grape hyacinths; there is no shortage of interest in the garden right now. 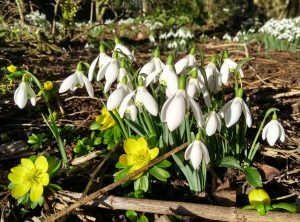 Without doubt, the crowning glory of February’s flora has to be the humble snowdrop. 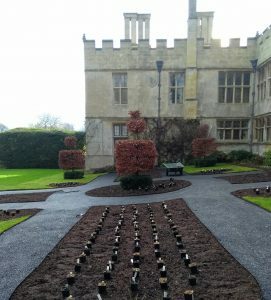 Here at Deene Park we have several acres of naturalised snowdrops, known botanically as Galanthus nivalis, their delicate pure white flowers nodding in the breeze, together with a multitude of named varieties with their unusually marked flowers…and for the next two Snowdrop Sundays, February 17th & 24th, you’ll have the opportunity to come and feast your eyes on this spectacular display. 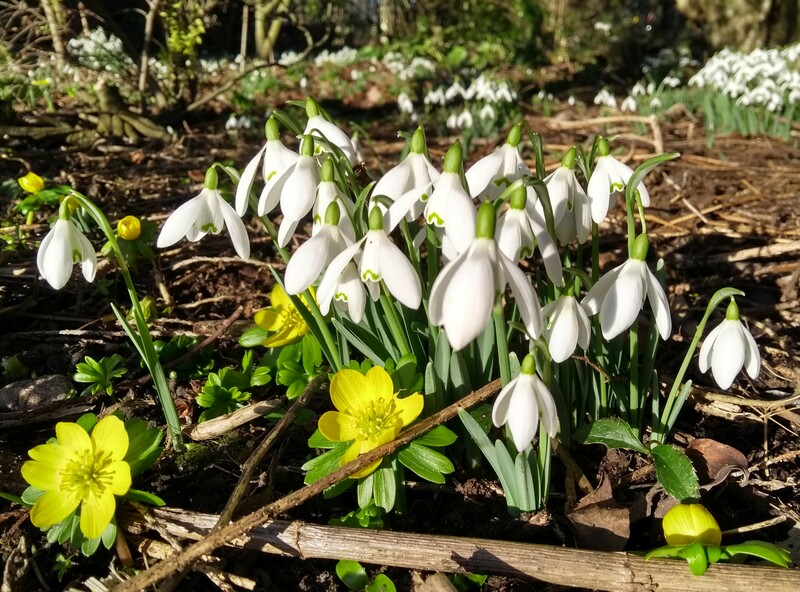 A stroll around the grounds is a great way to enjoy a family day out, followed by warming refreshments in our tea room, and the opportunity to purchase some of the home grown snowdrops and other spring flowers that we sell on our Snowdrop Sundays. Take a look at our website for full details. Elsewhere in the garden, our new Rose Garden is coming on leaps and bounds. We recently planted herbaceous perennials between the roses. This planting will provide groundcover and extend the flowering season beyond the June splendour of our English Roses. The herbaceous perennials used are white flowering catmint and salvias, which will be in bloom along with the roses and continue after the roses have faded. We also planted lady’s mantle, with downy silver coloured foliage that holds droplets of dew, like mercury pearls, and is smothered in a multitude of tiny chartreuse coloured flowers, held in dense clusters above the foliage. Lady’s mantle flowers prior to then in conjunction with the roses. Also flowering prior to the roses will be a variety of Iris with delicate shell pink blooms, that has been planted in the central circle. 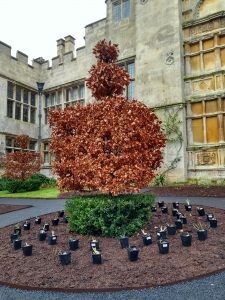 We still have some planting to do…we need to source and plant a border of Lavendula ‘Loddon Pink’ around each bed, then in autumn plant spring and summer flowering bulbs. Before Easter, we will also have had the paths finished off with a stone coloured bonded gravel surface. 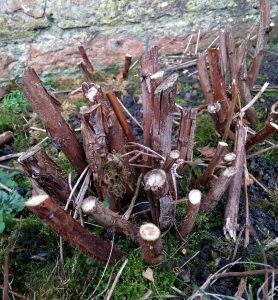 There are sometimes tasks in the garden that are prone to causing confusion, and one of those tasks is pruning raspberries. 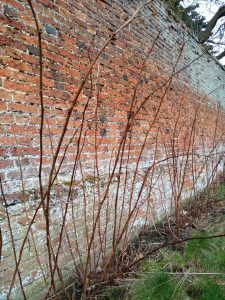 There are two types of raspberry, either summer fruiting or autumn fruiting, but what are the differences in the pruning requirements of each? 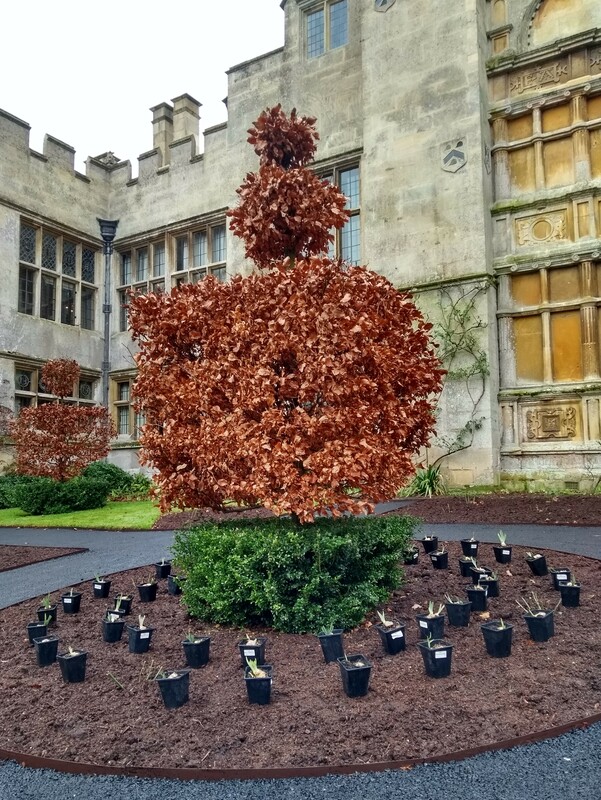 Here at Deene Park, we grow an autumn fruiting variety called ‘Polka’. Autumn fruiting varieties fruit on new growth from the coming season, whereas summer fruiting varieties fruit on one year old canes, canes that grew last season and will fruit in the coming season. So, how to prune. 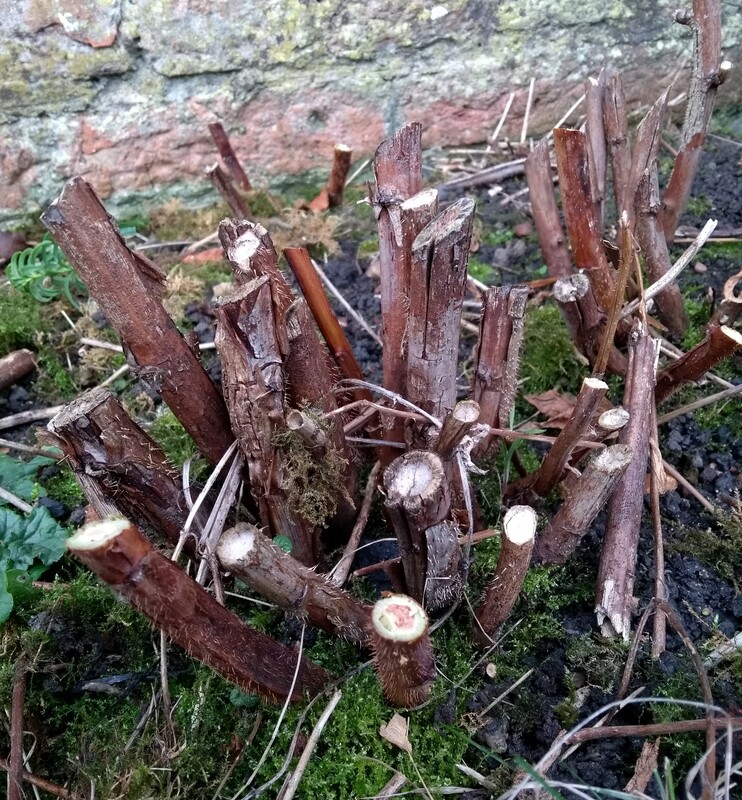 Autumn fruiting varieties are straight forward enough, simply cut all of last season’s canes down to an inch or two from ground level in February, job done. 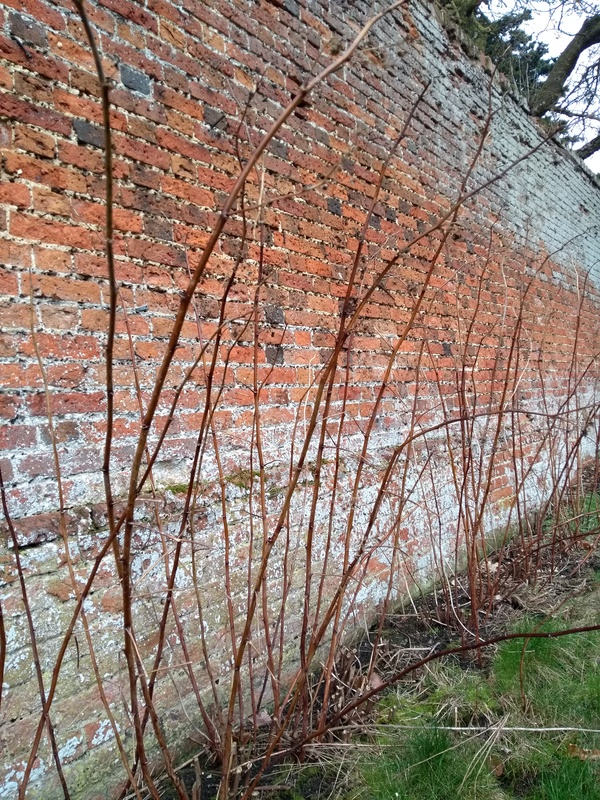 For summer fruiting varieties remove fruiting canes in the summer when the raspberries have been harvested, leaving non-fruiting canes to produce the next season’s crop. When you purchase raspberries, the label on the plant will tell you what fruiting type you have, or if not then a quick internet search will help you out. If you’ve inherited an unknown variety in a new garden, then observing their fruiting habits is the key to determining how to prune.